When did you decide you wanted to be a musician and what drew you to that point? I was a musician starting when I was about five. It was my parents who were music lovers and got me interested in music. They gave me piano lessons for a year, and then clarinet lessons starting when I was 6. They would take me to concerts and really got me into music. They’re both scientists. I would be studying chemistry, biology, physics, calculus, and all that stuff in high school. When I went to college, it was to study pre-med. I was a pre-med major at UCLA when I started college in 1973. In the summer of ’73 I went to Aspen. At the Aspen Music Festival people were saying “You know, you don’t want to study medicine. You want to be a musician. You want to do that for your career!” I said I love music but I’m enrolled in pre-med. A couple of years later I realized that those guys were right. So I transferred to Juilliard for my third year of college. That was when I decided I wanted to be a professional musician. After the Aspen Festival in 1973, 1975 was when I first started going to music school at Juilliard in New York. A couple of years later, in 1977, I was in the Chicago Symphony. It was a long road to deciding that I wanted music as a career, but fortunate that I was rewarded with success so soon after I made that decision. Who were some of the most influential people in your life? The most influential musician in my life, I would have to say, is Harold Wright. He was the Principal Clarinetist of the Boston Symphony, and before that of the National Symphony in Washington, D.C. I think when I was really little, I must’ve attended a concert that he played in Washington. My parents took me to one of the kiddie concerts at the National Symphony. I was born in Washington D.C., and when I was 2, we moved to California. When I was about 10, my dad bought me a recording of Harold Wright and Harris Goldsmith playing the Brahms Sonatas. Harold was the one that hooked me on the clarinet being a real, amazing, musical, expressive instrument. When I joined the Chicago Symphony, I met Ray Still. He was the Principal Oboist of the Chicago Symphony for 40 years. When I joined the CSO, he took me under his wing and I really learned so much from him. We played a lot of chamber music together, and obviously played a lot in the orchestra together. I consider Ray Still my musical hero. Harold Wright was my mentor from an early age. There have been a lot of influences – don’t get me wrong! Musicians, singers, composers, teachers. Gordon Herritt was my very first clarinet teacher. He was so patient with me from when I was 6-10 years old. Gary Gray was my awesome and intuitive, musical mentor in high school and college. Joe Allard was a great, many-faceted musician who was my teacher at Juilliard. Michele Zukovsky was my teacher during the summers while I was in college. She’s just retired after 56 years in the LA Philharmonic – pretty amazing. We’ve remained good friends. Here, in Chicago, one of my great mentors after Ray Still was Arnold Jacobs who was the tuba player in our orchestra. “Song and wind” is really his mantra. He taught respiration for musicians – an expert at that, and a real inspiration! What are some of the greatest challenges you’ve faced as a musician, and how have you overcome them? My number one challenge is scheduling. This may seem kind of mundane, but that’s my number one challenge as a human being. As a musician, there’s always stuff that you want to do and all these opportunities to do and you have to be able to say “No, I can’t do it at this time.” I hate saying no! As a musician, I would say just reaching the listener is the greatest challenge about performing. I think that’s always the number one priority: communicating. That’s a constant issue. How do you tell the story? How do you put across the message? That is the constant job of the communicating, professional musician. Of course I have many. One very special memory is performing in an orchestra together with my daughter. My daughter Molly, who is well known as a food blogger (www.mynameisyeh.com), is Juilliard-trained as a professional percussionist. We played for the first time in an orchestra together. (We’ve played as soloists together before). 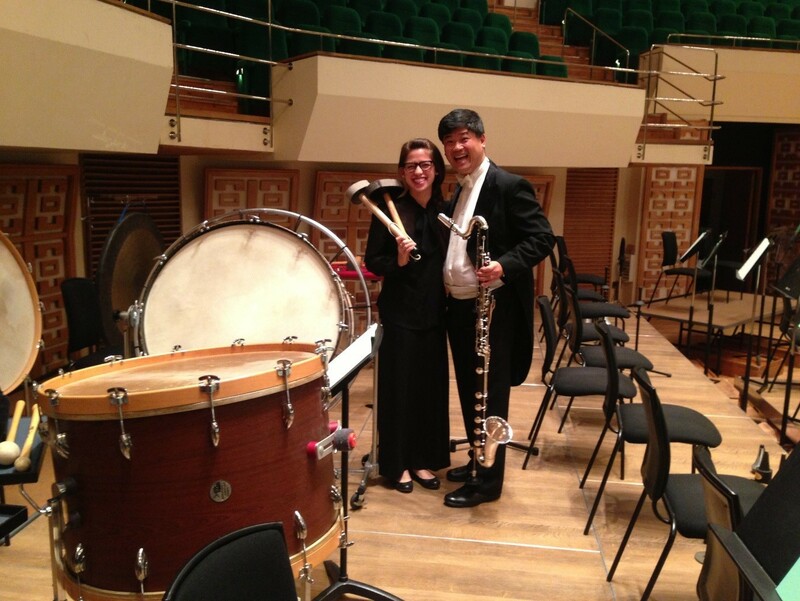 But, we first played in an orchestra together in 2013, which was the centennial of the Rite of Spring. We played with the Hong Kong Philharmonic. Both of us were called as extras, guest musicians, in the Hong Kong Philharmonic and we played Stravinsky’s The Rite of Spring. She played the tamtam and I played the bass clarinet. That’s one of the most memorable experiences of my life! It’s simply to love what I do for a living! That is such a gift and such a fortune, because what I love doing is making music and communicating with people.